What’s the best scooter for 4 year olds? What scooters do the funk bros use? What’s the best scooter for 5 years olds? What’s the best scooter for 6 year olds? What’s the best scooter for 7 years old? 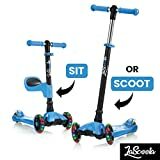 What’s the best scooter for kids aged 8 years or above? When it comes to the best scooters for kids the choices are many but still it is difficult to get the right one. The primary reason for this confusion is the fact that you are worried about the safety of your little one. However, what they want is maximum fun. So, it is the mix of safety and modern scooter features that you must look for when buying a kids scooter toy. The good news is, we have made this task easy. Please read on and select the toys that best fits your needs from the list below. Our list is formulated in a way to make it simple and effective to find your ideal product. Every single item on our review has been carefully chosen from the available products on the market. To be placed on the MyProScooter top list, the product is required to be fantastic quality, top rated by customers and current buyers. We have selected products for all budgets while keeping the high-quality standards adhered to. Here at MyProScooter, we have made sure to include something for everyone. Each item has been carefully researched and looked at, to pass the MPS Test. When buying a new product, we know that you need to information to be structured in an easy-to-read way, and things need to be kept quick and informative! Our review has been designed to reflect this. This is one of the top toys for children aged 5 years or above from this new Razor A3 with its classic look and top quality scooter features. For kids that young control has to be simple which is achieved through the simple rear fender brake system. It also features the new wheelie bar design. The whole structure is made from premium quality aircraft grade aluminum. It can stand up to 143 pounds and the adjustable height allows it to grow with the young one. It is appropriate for riding purposes only and should not be used for performing stunts. However, this push along toy can very well be the first step towards buying one of the cool pro toys for your kid in a few months. Why we like it: The classic and minimalistic design of this fun transportation device is a definite winner. For those who like their things simple, this one is definitely going to be a favorite. It has an all shinny metallic body with dark green grips and tires that bring a bit of fun. Micro Mini scooter hardly needs any introduction because it is that popular among parents and kids. It is a great present for 4 year olds with its adjustable T-bar handlebar. Despite being for kids, it is very sturdy and can stand up to 75 pounds. It uses the lean to steer technology for steering which teaches kids to balance and provides a safer ride. The wheels as well as the fiberglass reinforced deck provide essential shock absorption mechanism that gives the youngster a smooth experience. The Micro Mini scooter is certified by CPSC so absolutely no qualms about the safety of the younger one. Like it’s older brother, the Micro Maxi, this is definitely one to go for. If you are looking for a scooter perfect for a 2 year old, click here. Why we like it: What is not to love here? The Micro Mini scooter looks amazing with the transparent tires. The deck has the raised Micro logo which looks pretty cool. Your young one can perform some cool tricks whist whizzing past you on the sidewalk. Whether it is a boy or a girl you are buying this Razor A5 Lux scooter for, it has a color for both (blue and pink). It has an air-craft grade aluminum made deck and tube which is also why it is very light weight too. Its handlebar is adjustable so the youngster will not outgrow it any time soon. The wheels are quite large with a 200 mm diameter and provide a smooth ride. It is very portable thanks to the easy to fold mechanism. You can use it to get to school or take it to the park as it will roll on uneven surfaces seamlessly. Why we like it: This Razor A5 Lux scooter is a kids ride on toy that is very much affordable. The Razor A5 Lux scooter parts are good quality and the overall look is very stylish which ensures that you get good value for your money. Budget is often an important consideration so it makes a good choice when you want something reasonably priced. If you have a little princess at home then this is the greatest gift a girl can have. It has 3 wheels to provide the necessary stability and support for a very young girl who is only starting to scoot. The T-bar handlebar grows with the child as it adjustable. The lowest height is 17 inches and the highest is 25 inches. Girls as young as 2, can easily ride this and learn to balance. It can stand up to 75 pounds and is very long lasting. The front tires are quite big so run smoothly on surfaces that are uneven or bumpy. Why we liked it: The Micro Mini Deluxe kick scooter can make a perfect birthday present for a girl with its bright pink color. Any youngster would love to ride this wherever they go. It teaches them to balance as well with the lean to steer system. The Micro Mini original kick scooter style and look is just as good as its overall build. The Razor Pocket Mod (Betty) is one of the greatest toys for kids. It reminds you of old times with its vintage toy design. Unlike Razor’s pro scooter, this one is appropriate for teenagers and can stand a weight capacity of 170 pounds which is good enough for an electric scooter. The Pocket Mod Electric scooter is one of Razor’s newest toy range. It has a chain based motor with twist grip acceleration control. You get variable speeds and can go as fast as 15 mph. On full charge the range is up to 10 miles (roughly 40 minutes). The tires are sturdy pneumatic large sized 12 inches that absorb nasty shocks and give a smooth uninterrupted ride. It has two 12 volts sealed batteries so essentially 24 volts of rechargeable battery. Why we liked it: The looks a lot like a Vespa and therefore looks quite funky. The color choice is plenty with 6 colors including Betty, Sweet Pea, Navy, Vapor, Hot Red and Pink. Both genders would love to push this toy to class or practice. This is perhaps one of the best electric scooters for kids by Razor as it has so much up on offer. It has an all-steel frame and is powered by a chain based motor. It is pretty fast as you can go up to a speed of 15 mph. The Razor E300S has the 24 volts battery system that provides a continuous sailing along for 40 minutes. It is appropriate youngsters as well as late teenagers because of its extra-long and wide structure. It has a height of 42 inches which is good enough for someone very tall. The Razor E300 motorized scooter also has a pink color available so serves as a perfect scooter for girls. Why we like it: This one has a seat too which adds to the riders ease. You can comfortably sit and enjoy the leisure which requires very little effort on your part. It also has a hand brake system that speeds down and stops it whenever you like. For an alternative choice, try the Razor Powerwing caster scooter! The perfect gift? The new Yvolution A1 knows how to start a revolution and that is what they are doing with this model with a unique design. It is essentially a 3 wheel scooter but the two wheels at the back are separated. The deck consists of two bars extending from the handlebar and has a wheel at the either end. There is a board on each bar for the rider to place their foot. This unique design allows better drifting action so therefore it can be considered top for performing stunt tricks. For this reason, it has a quick response hand brake that lets you control your projection efficiently. The new Fuzion X3 Pro scooter is one of the recommended toys in the market right now and for all the right reasons. It is top quality, sturdy, safe and good value for money. It has a 20 inches long strong yet light aluminum based deck. The handlebar of the Fuzion X3 Pro scooter is attached by a triple bolt clamp that keeps the structure firm and rigid during your pro stunts. The 100 mm wheels provide a nice balance between performing stunts and riding. The strong Batwig bar is 18 inches wide and equipped with soft Pro hand grips. It is the top gift for kids who have mastered scooter riding and now are looking to perform stunts. Why we liked it: Fuzion is a brand that is renowned for their pro toys for kids and it goes without saying that their items for sale are designed to be durable. Obviously when you are paying so much for something, you need it to last long. It is safe to say that the Radio Flyer EZ-Rider takes inspiration from a bike as it has a big wheel on the front that makes it similar to a bike, at least when looked from the front. This giant wheel of course is designed to provide an effortless ride that takes into account the uneven surfaces in urban areas. The deck is wide so your son or daughter can put both feet on while riding a kids pro scooter. This would make for the perfect gift and children as young as 3 years can ride it easily. And it weighs only 6 pounds despite having a large sized wheel. It requires some assembly but you will be done in less than 15 minutes. Looking for the most popular product on the market, check out the new TFOX custom pro scooter here. Why we liked it: Its unique design makes it our favorite in this list. It looks very cool with the big wheel and red bars. Any tot would love to take this out and will definitely earn some fans. This Mongoose Zam scooter looks similar a bike with its large 12 inches Nylon wheels. Due to this, it is perfect for riding outdoors on pavements where there are cracks too. The handlebar style is inspired by BMX and provides necessary support for firmly holding on to the bar while riding. It is a bit heavy with over 19 pounds of weight but nothing a young girl cannot handle. The spring action foot pedal brakes ensure that the rider stops in a controlled fashion. The whole structure is made from a strong alloy and therefore is very durable. Why we liked it: The bright pink color of this model is perfect for females who love scooting. It is a good start for preparing them for bike riding. With this in their hands, they will get a taste of BMX too. The Jaykoo 3-wheeled Scooter is an award winning product, and we can see why. The light up wheels are great fun, and they are extremely durable – we know what kids can be like, so this is a great selling point. For added safety, the deck is grippy and secure. The Aluminum Alloy structure of the scooter is strong, but light. This is ideal for your child, and you can relax knowing how strong the construction is. To add even more security and safety to an already secure scooter, the Jaykoo is equipped with reliable brakes. Kids will love the fact that they can carve similar to that of a skateboard, this really is a fun and safe little scooter. Why we liked it: A scooter designed for children 3-12 years old, the Jaykoo has handlebars for extra balance while manoeuvring. Everything about the scooter fits the aims wanted for childrens scooters and the ideal christmas gift: Safe, Durable and Fun. The Mobius Deluxe Kids Scooter has been designed to be fun, while also being practible. It has the ability of 3-wheels, and it is foldable, too! The large PU wheels help to smoothen the ride, and will keep your kid having fun in comfort and style – for hours! The brakes are comprised of highly durable and reliable Stainless Steel ABS. The handlebars provide more practicality and usability, and can be adjusted for taller or smaller kids. Perfect for growing kids, as they do so fast. There is no set up assembling required for the Deluxe kick scooter – just quick and easy riding, you won’t get any impatient kids waiting! Mobius are so confident that you’ll love this product that they also offer a guaranteed 30 day full refund if you are unhappy. To add to the reassurance, there is a 24 Month Manufacturer’s Limited Warranty, as well. Why we liked it: The Mobius Deluxe kick scooter is designed for children 5 years and up, the Deluxe Mobius is practical, yet fun. With it’s useful ability to fold, and the reassurance of the 24 month warranty and 30 day full refund, ensures we have full confidence in this product. When considering all the Scooters for children, we believe them to be a fantastic choice for a Christmas gift for your child this year. Your kid can Scoot around in style in 2019, with Den Haven’s 3-wheeler. Comprised of aluminum metal with sturdy nylon parts, this is considered the same build quality as higher priced brands. For safety and stability, the 3-wheels have been introduced. You can feel reassured that your kid will be safe, while having endless amounts of fun. The wheels are large, allowing for stability on lumps and bumps in the road. Why we liked it: the Price is great value, and is of similar quality to brands with bigger labels. You can easily stow away this item, as it is foldable. The rear brake is easy to use, and highly effective. A great-value, and super fun scooter for your child, designed by Den Haven. The 3-wheeled Globber Primo has all the functionality to help your child learn to ride a scooter. There is a one-of-a-kind lock button that ensures your child scoots in a straight line, to help with balance and make the learning process as easy as possible. Once mastered, you can unlock the steering button, allowing your child to learn to steer effectively and safely, the pivot at the front enables smoother turns. Children grow… this is a fact, so the adjustable handlebars on the Primo are great. They adjust from 26.5 inches to 31 inches. Globber recommend this Scooter for ages 2 – 6 years. Why we liked it: Kids need to learn, but it’s great to be able to give them a helping hand and keep them safe, while doing so. That’s why we love the 3-wheeled Primo Glocbber. The easy lock button allows kids to learn to ride in a straight line, before they successfully move on to the next stage: steering. This is a great safety feature, that the other brands are just not doing. We think it sets this apart from the rest, it is one of the best scooters for children. Now we’re talking! For experienced kids, the Fuzion Z300 Pro Scooter is dipping into teen territory. However, for kids that have excelled in scooter riding, the Z300 is the perfect gift. This ride-on toy is not for the faint hearted, and will require some skill. However, if your child is experienced, and want’s more – this Fuzion Z300 will come in handy. Why We Liked It: The Fuzion Z300 is a large stepping stone, but it will help your child truly excel if they are serious about scooting! Do you have a scooter kid at home? This guide is going to make your search simple if you’re looking for a brilliant gift or toy that can help get them to work or the skate park. We have researched some of the top scooter brands and included the key takeaways in the guide below. This guide is equally helpful for parents looking for the highest rated scooter for both genders. Scootering is one of the most favorite things for many kids around the world. Ever since their advent the scene has only seen increasing popularity. These carefully designed items are designed keeping in view the size, height, weight and the needs of the kids. As a parent you want to get the best out of the toys for kids and in order to do that there are numerous things you should know about. Before we move on, the ideal age for kids to be riding is 4. Some parents want to buy the perfect present for 2 year old but we think that this too young of a age for scooter. For kids aged less than 5 years, a three wheeled toy is a must whether you are buying a normal or an powered one, although the latter are better for older kids only. The three wheels as opposed to two provide better stability which is essential for a kid this young as they cannot balance themselves. The additional wheel is usually on the front and the rear wheel is made wide to match this stability. For this reason, the deck is also wider as compared with two wheeled models. You will often read the term lean to steer for these toys for kids. It means that your son or daughter will have to lean to turn the thing and the handlebar plays no role in this. This technique is there to improve support as well as their intuition about directions. Children as young as 2 years old can scoot, so parents should buy them these toys because they are fun and help improve their walking and balancing. If you want to buy from the top brands that produce the highest quality toy, then you might have to spend a bit more. However, that is not always the case as some brands are good quality yet a lot cheaper. Razor, for instance, is just one such brand whose products are cutting edge, high standard and affordable. Other famous brands for kids are Micro, Fuzion, Mongoose and Apex. Brand is a personal choice but when you buy from a brand that is known for its products’ quality and durability, you have more satisfaction that you spend the money in the right place because after all everyone wants the highest quality of items for their kids. The pricing of toys for kids varies greatly and not all cheap baby products are low quality. You can easily find a decent model in under $100 while some high end models may cost over $200. Powered toys for kids are much more expensive than these kick ones and can cost upwards of $500. Ideally, you want a gift that meets your needs while staying in your budget. Our list is here to help you do just that as it has some great but affordable exercise machines to polish your kid’s scooter skills. appropriate for older kids or teenagers. There are many powered scooter products out there and these tend to be expensive. They usually cost hundreds of dollars. As for performance, they can go pretty fast but speed varies from one model to another. For kids these battery powered vehicles can go up to a speed of 15 mph which is decent and safe enough considering a child is on it. The only benefit of motorized toys is the comfort they provide as they do the kick work for you with their motors. In comparison, kick toy products are lighter so a lot easy to handle and carry. These are good for teaching the young one how to balance and most kids essentially use these before going for the powered ones. Another great advantage is that they require no charging of course so you are not bound to have it charged before hitting the street or park. And these are the only ones which you can perform tricks and stuff. When it comes to kids, the truth is no matter how strong the thing is there is a great chance that perhaps a part will come loose or wear out with time. Therefore another important consideration is the availability of parts because if they can be replaced easily you will not have to buy a brand new toy. Luckily enough, here in 2019, you can easily find parts from many brands like Micro or Razor. So if something wears out you can just buy the part and make the product as good as new. If you are buying for a youngster then focus on the weight and stability of the scooter. You should buy the lightest model you can find especially if the toddler is 2 or 3 years old and just beginning to scoot. Also check for the height of the bar to ensure that it reaches the waist of the kid. Choose an adjustable one so the fun transportation device grows with the child at least for a few years. For kids 5 or older, a two wheeled scooter is also appropriate. Here too similar conditions apply so the lighter it is the better it will be for them to maneuver. If you think your child will need to take it out a lot then choose the one that is foldable. This way it will be much easier to hold it in your arms or put it in the boot of the car. Generally, the bigger the wheels the smoother the comfort is so if you live in a vicinity with bumpy surfaces, tires 120 mm or above should be chosen. You can even go for the bike style toys that have large wheels. With these you can prepare them for the bike rides too and teach them to balance properly. If the child has been scooter riding for some years and can perfectly balance this year in 2019, then they can try out the pro toys that can allow them to perform stunts. These are products dedicated especially to this purpose and have smaller wheels, fixed bars, and very lightweight structure. The highest rated brands for these are Apex, Micro, Madd Gear Pro, and Sacrifice. When going for the powered option, make sure to check out all the specifications about the battery like if it is 24 volts and also about the performance as to how fast it is and what range it has. The latter is very important and should match with your needs. These toys are getting quite popular and you can easily find customized ones like pink colored for females. When it comes to kid’s toys then safety is a primary concern for all parents. Manufacturers all around the world are continuously improving the technology used for making these and as a result we are seeing models that are very safe and secure. Whether it is a toddler riding or a teenager, the scooter parts are sturdy and fixed firmly so no mishap happens. Usually for this very concern people buy from trusted brands to ensure that their kid’s toys are safe. Of course safety is not limited to the products only; you have to take responsibility as well. You need to buy helmets and ensure that the person wears it every time he or she goes out. We recently reviewed the best scooter helmets for kids and we recommend your child wears one whilst riding. When your child starts performing stunts then it is also important to make sure that they wear knee and elbow pads. Kids aged 4 are very small and are still developing their balancing and riding skills. Kids as young as 2 years can easily push toys so there is no issue with a 4 year old riding it. Of course, stability is a primary requirement for this age so only three wheeled scooters should be used. A very popular choice for kids this age is Micro Mini Deluxe. This three wheeled scooter is perfect for little ones in every way as it is designed to provide the necessary support with its two wheels on the front and the wide rear wheels. It uses the lean to steer technology that requires the boy or girl to lean right or left to turn. This works out great for keeping them balanced and teaching them how to turn directions. It also has a soft grip for them to hold on to the bars. Another great thing about this particular model is that it has adjustable handlebar height. That means that it can grow with your child. Most parents are concerned that a child this small will soon outgrow a toy so why buy something expensive? This is not going to be the case here as you can easily adjust the T-bar height wherever your child finds it comfortable. It also comes in an array of colors so whether you have a girl or a boy, you will find something they will love. And it looks absolutely fantastic so your kid will look very cool taking it out for a spin. Yes, they can even kick-push them outside on driveways or parks. It is good considering your young one will soon use a two wheel scooter. In order to get to that stage, they should be riding a three wheels one that teaches them the right way to balance and gives them a taste of scooter riding. Although, not advisable but if you’re looking for a fun transportation device for your 3 years old you should also keep the above in mind. Click here for more reviews. The Funk bros, Corey and his older brother Capron use the Apex Pro. They have been winning competitions all around the world for their amazing scooter riding skills. Corey has traveled to so many countries like Australia, UK and Spain showing his scooting and stunt skills. He is considered as the number one scooter champ in the United States. They use Apex Pro for all their rides and competitions. Apex is an Australian brand known for their stunt toys. Their products are extremely lightweight hence the choice for all the pro riders. So many children take inspiration from the funk bros and want to become stunt riders like them. Of course that means they have to learn to scoot first and then move on to learning to perform tricks. It is important to buy these kids high quality toys according to their age so they progress fast. When your kid is 5 years old, they are big enough to ride even a two wheeled scooter. Keeping that in mind, the Flyer EZ rider is the best product for them. It is innovative, sturdy and yet simple to handle for a kid that young. Its big front wheel is designed to absorb shocks and give a smooth ride even on rough surfaces. Since your kid is 5, they will most definitely take it outside to travel with their friends. And outside the surfaces are not very smooth as most urban or even suburban pavements are filled with cracks. For this reason the Flyer EZ is a great choice for riding outdoors too. Despite the big wheel and strong structure, it is not heavy so a five year old kid can easily push it without getting tired. Since these kids have already ridden three wheeled products they can easily ride one with only two. This prepares them enough to try out stunt toys later as they grow. Also, it has the handlebar that is inspired by BMX. So they also get a taste of bike riding along the way. For all these reasons, this model is definitely the highest rated scooter for a 5 year old child. Please keep the below points in mind if you’re looking for this toy for 6 yr old. At this age, the kids have grown enough to travel on a regular toy that is advanced from what we usually call a toddler scooter. These are usually first grade kids and can even use it to go to school. So the top choice for these kids is Razor’s A3 Kick Scooter. It is a product that is designed to be very convenient. With its simple folding mechanism, it is so much natural to just fold it and carry anywhere. And when we talk about carrying, taking into consideration weight is necessary. Its weight is very light and will almost feel like a feather when you have to hold it. This works out great for parents too because they are the ones who have to carry it to the parks and all. It has a simple design yet looks very cool because of its shiny parts. This one too has adjustable bar height so it can easily grow with the child. The wheels are quite sturdy and can take even very tough surfaces. This one is a perfect bridge between the comfortable toddler specific ones and the advanced pro ones that require a little bit riding experience. Any 6 year old can master this one in a matter of days. Luckily for parents, it is quite affordable too which is what they are famous for. The A3 can be ridden by a 7 year old too but if you want something a tad bit more advanced and appropriate for this age group then we recommend Fuzion X3 Pro scooter. Why? By this time if your kid has been riding ever since he or she was a toddler, then they are more than ready to start riding a pro scooter. At this age, children start learning to perform stunts and tricks. So obviously to master these skills they need something that supports it. This is why we think this is one of the best scooters for kids this year. The Fuzion X3 pro scooter is optimized for stunts as it has a rigid and fixed handlebar with a triple bolt clamp. The structure is super light which is helpful when performing scootering stunts.At this age children are already skilled at scooting and want to try something new and exciting so they go for pro and stunt models that are specifically designed for these purposes. Any kid who loves this adventurous sport would want to start on early and this age range is the perfect age for that. Fuzion is brand known widely in the world of scooting and their core purpose is to make high end stunt models that are sturdy yet lightweight to optimize the skills of these budding riders. Safety is always a concern for parents so they should opt for the most lightweight structure. Of course since wearing a helmet is always necessary and parents should ensure that the kid is wearing one at all times when riding. 8 years is old enough to start riding an electric scooter. In fact they do not even need to ride three wheeled motorized ones as they have developed the skills to control the ride. So a good choice for these children is the Razor E300S as it is fast and advanced as compared with regular toys without batteries and motors. This one is a great product from them as it can withstand quite a lot of weight capacity and can go up to a speed of 15 mph. They would probably want to ride their way to the school and this provides a very comfortable ride. They can even sit on the seat provided and the ride can last for 40 minutes. This means that they can go to the school and come back on charging it to 100%. It is good for older kids as well as teenagers so they can continue to ride it for a long time to come provided it is maintained well. The company are dedicated to producing quality models that are affordable too and the E300S is just one of those products that bridge the gap between quality and low price. A powered toy can be very expensive so this one is definitely a winner when it comes to great value for money. The structure is wide and long enough to accommodate all sizes. The varying colors give enough choice for both genders. The pink version of course is going to be loved by all the girls. It is very simple to control and the speed is enough to get them to places in time teaching them a very important trait in life, punctuality. If you liked our review of the best scooters for kids, please leave your feedback. Thank you Jason, this article really helped me out a lot. I went for the 3rd one down for my girl, she loves it!! Jason you legend. Got the radio flyer one for my boy. Grabbed the Razor kids scooter for my little Ellie. She loves it. Fantastic children’s scooter!